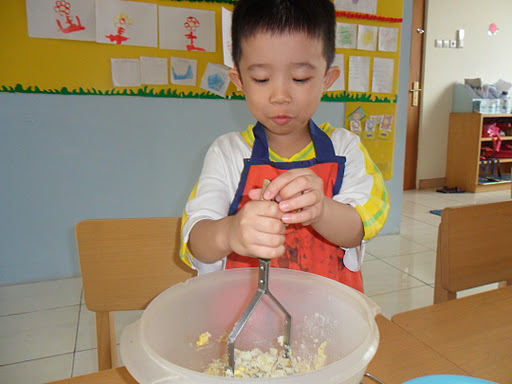 In part one Yitzha (Icha) Sarwono described how the central elements of Montessori define her teaching. In this part, she tells us about she became interested in Dogme ELT and how she has tried to implement it in her own class so far. What first attracted me to Dogme teaching was the fact that it allows both teachers and students to explore more on what they really need instead of following a text book. I think Dogme is somewhat similar to Montessori in term of its focus which is on the students. I don’t use any textbooks at all, just worksheets that are made based on what the students need to achieve so it varies between each student. We give them one and a half hour each day to explore what they want to work on while teaching them one on one. I will focus on their academic teaching while my assistants help them in exploring more on other aspects like practical life, culture etc. And then we’ll have circle time where we will discuss about the topic and etc. As a teacher I’ve always tried to find a way to make my class understand the lesson that I’m trying to get across, and for years I’ve tried to apply ways that I thought will make the learning process more fun as well as engaging for them. But of course aside from the lesson, I’ve always tried to build them up in couple of aspects that I could also achieve, like their confidence for example. For the past 2 years I’ve been involved in teaching kindergarten Montessori classes. One of my main concerns is actually what they have during snack time. It is almost impossible to see them having vegetables in their lunch box! They seem to prefer having bread, rice and chicken nuggets, or jelly for their snacks. Of course our school has always provided either fruit or milk for them but still even though I’ve tried so many times to introduce greens to them. I found out that many of them have actually never got a proper introduction to vegetables at home.So, for quite some time I have been having lunch along with them, hoping for them to see what I have in my lunch box (and you can bet that I bring vegetables with me everyday!). Starting with introducing them and saying how delicious they are to my tongue to sharing some of my veggies to them. But of course it hasn’t always been easy as they mostly refuse to try my food. So I thought that I’d try dedicating a whole week to get them to meet and get to know greens very well, as vegetables is one of the lesson we learn in school too. And as I’ve been sort of introduced to Dogme teaching, and find it quite interesting to apply it on my Montessori class, I thought I would try to apply it to teaching about vegetables. So I set up my goals and planned my lesson and this is what I’ve done in classroom during presentation and circle time. Topics: As Vegetables are my topic of the week, I bought all the fresh vegetables that we are most likely to find and use to cook for our food at home, brought them to classroom and introduced them all to my students. I mentioned how good they are to our body. I laid them out one by one and explained them all. One thing is for sure though, some of my students kind of dislike the smell of the green stuff! Science: We put a handful of green beans into two bowls. In one bowl, I asked them to put dry cotton among the beans and in another, wet cotton and then put them by the window, to meet the sunlight. I told them that in few days, we’re gonna see the difference between two bowls. They were very surprised and happy of course to learn that the bowls with the wet cottons has produced great looking growing bean sprouts! While the other one stayed still as a collection of green beans. 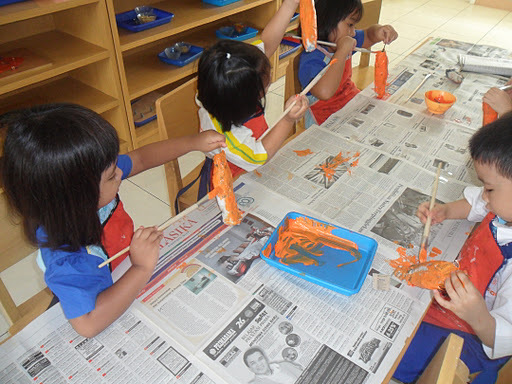 Construction art: As carrot is probably one of the most popular vegetable for them, we made paper maché carrots. It’s actually ended up as a 3 days project but my students loved it so much! Printing art: We made veggie printing pizza. I prepared cardboard in a round shape like a pizza, then prepared lots of vegetable and spices like french beans, onion, garlic, carrot, and mushroom. The children dipped the veggie and spices to their chosen paints and then print them on the cardboard pizza. Math: As we learnt about addition, I got them to do it by using the french beans. They loved it so much and when later I gave them some worksheet with pictures of vegetables on it, they were gladly doing it. In tomorrow’s third part, Icha will give some more practical examples of how she has adapted Dogme for her classroom by creating teaching ‘booths’.